These ancient tombs have long since been robbed of their original contents, but now serve as a lair for a Xeraphi war party. Above each tomb entrance is an obelisk. Once covered in runes of a long dead language, erosion has rendered them nearly smooth. The largest tomb contains an entrance into the dungeon below. Sitting on a ledge just north of the tombs are what appear to be three giant, rough-hewn, humanoid statues. In reality, these are three earth elemental beings that live here. This is not a combat encounter, rather it is an atmospheric encounter. The statues cannot be harmed and they move incrementally slow — a few inches an hour when they are in a hurry. If adventurers are disrespectful, the statues can move to block their passage out of the ruins. If respectful, the statues might even try to give the adventurers clues. Otherwise, these beings demonstrate the otherworldliness of the wilderness. This tower was carved straight from rock and stands seven stories high. Ornate glyphs cover every inch, though erosion has made it almost impossible to decipher them. The only entrance to the tower is four stories up. Within the tower is an entrance into the dungeon below. This is the lair of a vicious Chaos Beast and a tribe of Ranine that are the beast's care-takers/worshippers. Though there is no entrance to the dungeon below from these caves, there is room for expansion into a sub-level, or lower levels of the dungeon beneath. This series of caves in the home of Chaos-tainted vermin. This once belonged to the defenses of the ancient city and is one of the few surviving structures that isn't entirely carved out of the stone of the ancient river bed. It has also seen recent construction. 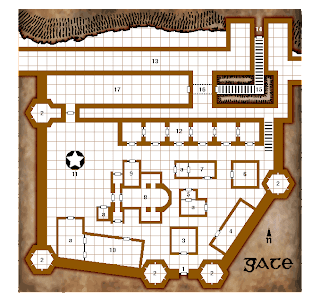 A war party of Chaotic humanoids have turned the gatehouse into a lair, and have rebuilt its defenses. The gatehouse also has an entrance into the dungeon below. In the world of Erimia, monsters and the forces of Chaos are personifications and physical manifestations of sin. This is in keeping with the metaphor of the campaign where adventurers are akin to Christian monastics venturing out into the wilderness in order to fight the devil and his minions where they live. This raises the question, what is sin? "You shall love the Lord your God with all your heart, with all your soul, and with all your mind . . .You shall love your neighbor as yourself" (Matt. 22:37,39). Gluttony — I wastefully consume at the expense of those who hunger, harming not only my relationship with my fellow human being, but with the earth that provides my food, and my God who gives me all of these things as gifts. Sloth—I fail to love anything enough to give my all. This harms relationships with everybody — nothing, neither God nor anything in creation, is worth my time and effort. Lust—I objectify my fellow human being, subjecting them to my own selfish need for pleasure. I disregard both their needs, and the image of God within them. From the perspective of sin, there is no such thing as a victimless crime (as anyone who has a relative that is an alcoholic or addict can tell you). In designing Erimian monsters as personifications and physical manifestations of sin, I try to give them abilities, tactics and/or powers that actively try to destroy relationships. This destruction then leads to an easier target to kill. As adventurers continue to encounter these monsters, they must work together to create strategies to prevent the destruction of these relationships in order to more effectively overcome the monsters and the sins they personify. Xeraphi are small, aggressive cousins of the gnolls. Their size and lower hit dice are deceptive — Xeraphi can be extremely dangerous. Their skin excretes a liquid that gives off a scent that sends other creatures into a blind fury. Non-xeraphi with an Int less than 17 must save vs. spell or go berserk, attacking friend and foe for 10 rounds. Only one save is necessary per encounter. In addition, this liquid can be boiled down into a sticky substance the Xeraphi put onto their weapons. Any successful strike by a Xeraphi requires their target to save v. poison or take an additional d6 damage. This poison may be taken from the pelts of the Xeraphi. Each corpse will produce 1d3 doses. However, anyone using this poison will also produce the fury inducing scent that requires every new encounter to save v spells or go berserk. Xeraphi travel in packs. These packs are generally lead by female necromancers and Xeraphi are very comfortable around the undead — they are one of the few non-Xeraphi that are immune to their scent. When a pack is encountered, it usually includes undead, especially skeletons and zombies. 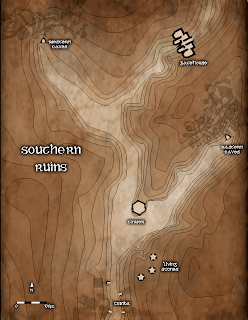 Here is a map and description of Gate for the Erimia Campaign. This small community of those soldiers (mostly Replicants) who guard and maintain the small gate of the city and those merchants that sell the soldiers their wares serves as the launching point for adventurers into the wilderness. 1. Gate to the City. Made of solid iron, it is lifted using a winch operated from the towers on either side of the gate. These are manned 24 hours a day. There will always be a minimum of two soldiers in each tower. In times of high alert, this number will be increased to as many as five. The military of Ipolis is organized into units of 100 soldiers, each known as a Century. The unit stationed in Gate has the sole duty of guarding the gate to the city. Known by various names, such as the Flaming Swords, the Cherubic Century, and the 100 Angels, their unit symbol is a flaming sword (Genesis 4:24). Every soldier in the Century must be celibate. The priorities of the unit do not allow for a proper raising of a family. Thus, when a soldier wishes to marry, he must transfer to a different unit or retire. This gives Gate (especially under the spiritual leadership of Fr. Gerasimos) a very monastic feel. NPCs in Gate will have a love/hate attitude towards adventurers. They will greatly admire and respect anyone who goes out to fight Chaos on its own turf. However, they will be wary of them at the same time — adventurers are constantly scrutinized for when (not if) they fall under the influence of the Chaos they fight. Burok, the Signifier of the Flaming Swords, comes from a merchant family led by his elder brother. They are going through a difficult time, economically, and is being pressured to use his position to bring some cash flow to the family. He's honest when he can, but is not above the occasional cheat. The one citizen of Gate that ventures outside the city walls on a semi-regular basis is the Herbalist Eamon. An elf and a former soldier, he is interested to see if he can use the strange plants in the wilderness to do good. He has a wide selection of potions and herbal treatments for all kinds of ailments. The Flaming Swords are commanded by the Centurion Blaise. He is a confident man, obsessed with history and his place in it. His second in command, the Optio Zilas, is a staunch conservative who uses all the influence he can to maintain the status-quo. The blacksmith of Gate is a Dwarf named Columba. He is a former soldier whose unit went on regular patrols outside the city. He got caught in a river of chaos energy and no longer trusts himself go venture out of the city. He does what he can to fight Chaos by equipping soldiers and adventurers with the armor and weapons they need to carry on the fight. If a relationship is cultivated, adventurers will find a staunch ally in Columba. 8. Chapel of the Taxiarchai. Dedicated to the Archangels, this is where the people of Gate come to pray. Fr. Gerasimos maintains a monastic schedule, and there are services everyday throughout the day. This is used to store the various items used in the chapel: books, chalices, utensils, vestments, wine, bread, etc. It is locked at all times. Fr. Gerasimos has the only key. Fr. Gerasimos is a quiet and humble man who leads by example. He is more often than not in the Chapel praying than he is at home. The one place where Fr. Gerasimos has yet to have any influence. This serves both as a mess hall and as a tavern where soldiers let off steam. The cook of the Flaming Sword, Wolfram aka "Cookie," is a veteran fighter who happens to be better in the kitchen than on the wall. Although he enjoys his work, Cookie prefers the life of a soldier and is the first to a fight, wielding whatever is at hand as a weapon. Wolfram aka "Cookie" Fighter Lvl 4 Lawful S17 I11 W10 D14 C7 Ch9 HP 20 Special: Cookie is extremely skilled at using impromptu weapons, such as an iron skillet. He receives a +1 to hit whenever using such a weapon. 11. Statue of the Cherubic Guardian. Here stands a 30 foot tall image of a Cherubim — a multi-eyed, awe-inspiring warrior angel wielding a flaming sword. It is carved granite and there is an extreme amount of wear on the right foot of the angel, where soldiers seeking blessings have worn down the detail on the foot by touching it for several hundred years. The statue radiates an aura of holiness. Any Lawful creature within a 20 foot radius receives a bonus of 1 on every die roll. Any Chaotic creature receives a penalty of 1 on every die roll. In addition, anyone who does a prayer asking for help or strength from the angels, Christ, or God and touches the statue receives the effects of a Bless spell for the next 24 hours. The Tesserarius, Gabryl, has recently been promoted due to the death of a very popular officer. As a result, he has yet to earn the respect of his men, and is constantly trying to figure out ways to do so. Since Ipolis has no trade with other cities, and a populace that has little or no reason to travel outside the walls of the city, the gate of the city (more of a door, really) serves only two purposes. Firstly, it gives minimal access to the outside world for those that do need to venture out (soldiers for routine patrols, mainly). Secondly, it serves as a trap for the invading forces of Chaos that periodically test the defenses of the city. The gate itself is iron and opens vertically using winches on the city wall. It is locked using two iron rods that mechanically slide into the gate from the city wall itself. The door is recessed into the city wall, allowing the defenders of the city to create a kill zone right in front of the gate. Indeed, the battlements above are equipped with hot oil, stones, crossbows and ballistas. If invaders get through the gate, they must ascend a set of stairs made of slick, rounded stone. On either side of the stairs are 30 ft. deep, spiked pits. The stairs are also trapped — a lever on the city wall above triggers the upper section of the stairs to go flat and create a slide, dooming invaders to a ride into the spiked pits below. Invaders must endure all of this while defenders pelt them from above on the city walls. For those invaders that survive the gate and the stairs, this tunnel, coated with a thick layer of dark glass, awaits. In the ceiling there are hundreds of holes, and the floor slopes down from the edges to form an oblong bowl. On the city wall above the tunnel are three levers. Two control the locks on the iron doors at either end of the tunnel and the other releases acid through the holes in the ceiling of the tunnel. Not only will invaders be showered with acid, but the acid pools in the bowl-shaped floor, which becomes slick when wet. Thus, even when the defenders run out of acid to shower invaders from above, defenders must wade through an acid pool and risk losing their footing on the glass floor. Named after a soldier who single-handedly held off a beast of Chaos in this very place until reinforcements could arrive to kill the creature. Mosaics depicting this epic battle line the walls. The alley is a final kill zone for any invaders that manage to get past the trapped stairs and tunnel. It also serves as a staging point for units who periodically patrol beyond the city walls. 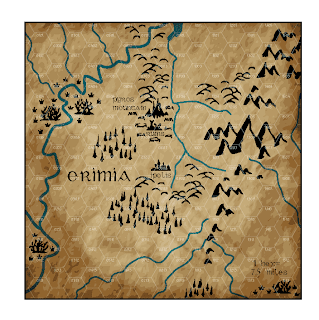 This is a map of Erimia. I have not named many of the landmarks on purpose. For one, the citizens of Ipolis have no need to name anything, because they very rarely, if ever, venture outside the city walls. Secondly, I really like the process of players interacting with a world. When that creative process comes up with names, the world jumps off the page and begins to live in a way that I never could have made it by naming everything. Hex 0808: The city of Ipolis (which literally means "the City") is a giant walled metropolis and a haven from the Chaos that rules the wilderness around it. With the powerful magics available to it from the energy node that lies at the center of the city, Ipolis is virtually self-sustaining. It has no trade with other cities — even if it knew of other cities, it has no real need. The only outside contact the citizens have is through the small community of Gate — those soldiers (mostly Replicants) who guard and maintain the small gate of the city and those merchants that sell the soldiers their wares. Hex 0805: Pyros Mountain (meaning "Fire") looms large in the minds of the citizens of Ipolis. It is called Pyros Mountain because of the mysterious glow it gives off at night, which can be seen for miles. Thought to be the source of many of the strange monsters that occasionally test the defenses of the city, it is at the center of every nightmarish imagining of the people of Ipolis. Indeed, the glow is the result of a fragment of a chaos weapon that fell from the sky during the Great Cataclysm and buried itself deep within the bowels of the earth. Hex 0705: Here are the ruins of a city that was ancient at the time of the Great Cataclysm. Called Aripia (or "Ruins") it is carved out of the rock of antediluvian river beds and stands between Ipolis and Pyros Mountain. Some of its spires can be seen from the city walls. In the past, adventurous souls have wandered out to see these great carvings. Those that returned told tales of their wonder and hinted at untold wealth that might be buried beneath. When tales are told of the Golden Age before the Great Cataclysm, they often tell of the wonders of this city that now lies in ruin.